Register for a first order discount to buy this for just £533.70, saving £59.30. Delicately designed, this Shagreen Side Table makes for a lovely touch inside your home or office space. This handmade product is beautifully designed using MDF, a high quality materials used for making mirrored furniture. It's paired with an equally stunning champagne shagreen under glass. The table is squarish in shape with a single drawer fitted at the front. Meanwhile, it's supported by a slim yet solid frame in an antique brass finish. 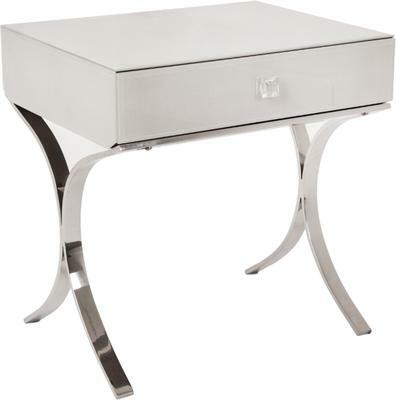 Perfect for your living room or bedroom, this side table not only brings in style but also plenty of function.